The skirt hem unpinned and ready for some math. Yesterday, as you know, I spent some time thinking about the golden ratio and how it applied to the hemline of the skirt I made to match my trench coat. Since I was trying to measure myself, I had come up with a number for the width of my shoulders that was too narrow. That error translated into my pinning the skirt too short. Today, instead of rushing into pinning again, I’m going to pause with my work on this skirt and spend a bit more time with my math. From the little bit of research I’ve done on how the golden ratio applies to my skirt hemline, I’ve found that the same principles can be applied across an entire outfit. And, to good design in general – be it clothes, art, architecture, et cetera. 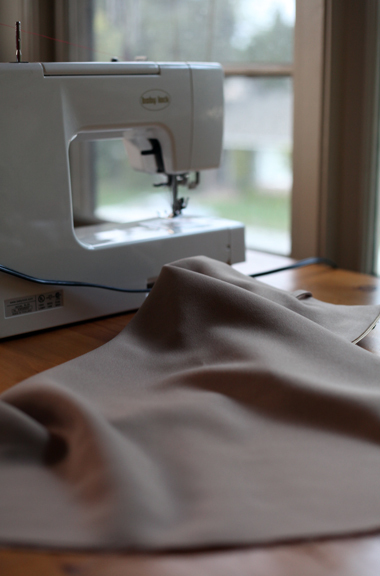 Since my aim in this process is to learn how to sew well, I am going to take my time and learn as much as I can about how I can apply the golden ratio to my sewing and design. When I finally hem this skirt, I want to be certain of the length that I choose. I am a scientist after all! Thank you for your encouragement! I’m currently fascinated with this golden ratio stuff. One question for you – this skirt sits below my waist as it is now. Since it won’t be able to create a sharp line across my waist as yours will, will that change how I think about these numbers? Or, is the golden ratio set simply by my body measurements?